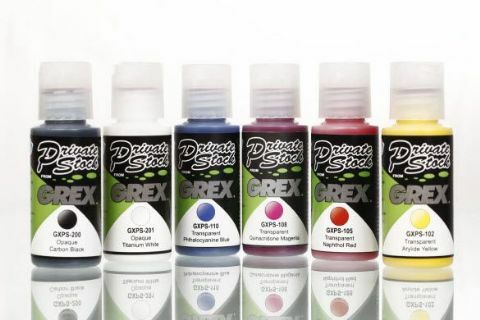 ThGrex Private Stock range, a versatile ALL SURFACE paint for art & custom painting. Glowing hot, vibrant neon's under black light conditions. Vivid color response for day-light conditions where bright intense color is desired. These are some of the brightest and hottest fluorescent colors available. These are made from some of the highest lightfast fluorescent pigments available, making these colors exceptionally stable when compared to others in the market. Pol'E TAC is designed with a harder acrylic type and specialized modifiers for a higher tensile strength, low viscosity solution that can produce a harder lower tact film much like a fixative. It has a water thin milky consistency but produces a transparent finish when dry. Used to dilute Private Stock™ for those who wish to use low PSI or a thinner fluid acrylics for layering applications. Can be sprayed straight from the bottle as a foundation for layering color builds on textiles.